In what one former undersecretary described as a “cry from the heart,” diplomats urged senators to grill Mike Pompeo about his plans to reverse the corrosion of the State Department at his confirmation hearing. Clifford’s lawyer said Trump’s statement would be shown to be untruthful if he is deposed. The statement also raises questions of whether the hush agreement is valid, given one party did not know about it. Open Secrets reported that in the final weeks leading up the 2016 election, Robert Mercer donated to Secure America Now, a group that used Facebook and Google to target anti-Muslim ads at swing voters. On Thursday, at a speech in West Virginia to talk about the new tax law, Trump read the first lines of the speech, then threw the pieces of paper it was written on into the air, and instead preceded to give a rambling speech. On Tuesday, Judge Rebecca Dallet won a bitter race for a seat on the Wisconsin Supreme Court, 56-44. Democrats in Wisconsin had not won an open Supreme Court seat election since 1995. On Thursday, CBS News reported Pruitt wanted to use his vehicle’s lights and sirens to get to his official appointment. When his security detail told him sirens could be used only in emergencies, the agent, a 16-year veteran was removed from his detail. On Thursday, NYT reported at least five officials at the EPA, four of them high ranking and one a Trump appointee, were reassigned or demoted after raising concerns about Pruitt’s spending and management of the agency. THE LIST — weeks 1–52 of The Weekly List is out as a book on Tuesday! You can order your copy by clicking here. 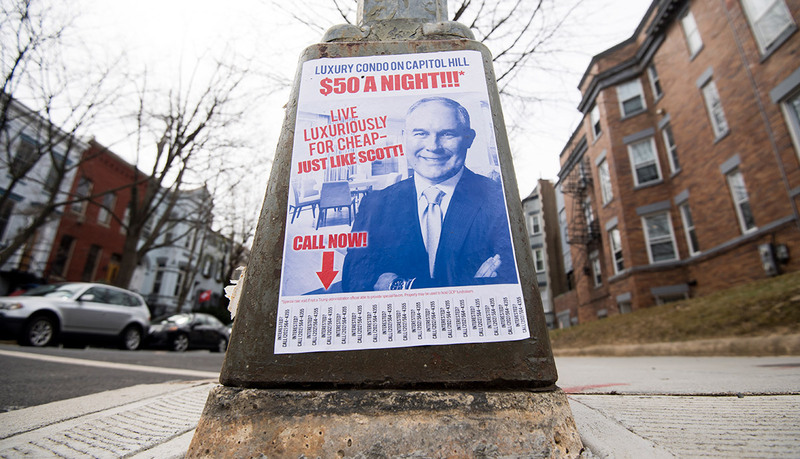 Posters mocking EPA Administrator Scott Pruitt’s $50 per night housing in Washington have been posted around Capitol Hill.